David Broughton Artist. has written a massively detailed blog post on the creation of the ABC Warriors strip for this years summer special. Thanks to David for all his work supporting Zarjaz and all the other titles at FQP. Thought Bubble really is the best comic con in the country in my opinion. This year we were lucky enough to be table neighbours with the Psychedelic Journal, Killing Moon, Neil McClements and our very own Gingerdan who spent the weekend working on a series of increasingly superb commissions. Thanks to all who stopped by, bought comics and chatted. We had a spot near the front of the New Dock this year and there was a lot of passing trade. The most common discussion point this weekend was ‘When are you opening for scripts again?’ and the simple answer is ‘Not sure, but soon.’ There is a much longer, involved answer using spreadsheets and stuff, but you don’t need me to start on that. Another awesome (and believe me, this is not just being used as hyperbole) event last weekend was the showing of the Strontium Dog fan film: ‘Search & Destroy’ at the Everyman cinema in Leeds. A huge congratulations to all involved in making this happen, and for inviting us along to the screening. The version shown wasn’t quite finished, but having John Wagner himself approve of the film in its current state is a sure sign that the film is heading the right way. Martin Currie, also known as ‘The Raygun Consultant’ recorded a podcast at the gig, and asked me to take part. The podcast is a lot of fun and if you want to take a listen it is available here. I’m speaking between 09.28 and 11.10 but the whole recording is a lot of fun. Martin also took this rather superb pic of me and the kids. I don’t normally post pics like this, but this is a great shot. As normal, I’m going to be posting links as and where I find them to reviews of the new comics. If you come across a review I’ve not mentioned here, can you let me know so I can find! First up is the ever wonderful Down The Tubes, where John Freeman had This to say. The good folk over at the Fobidden Planet blog have promoted the new titles as part of their Friday news round up. Thanks to Joe Gordon for thinking of us! Cover artist Neil Roberts brings us the latest look in law enforcement as Peeps the droid delivers yet another issue of Zarjaz. 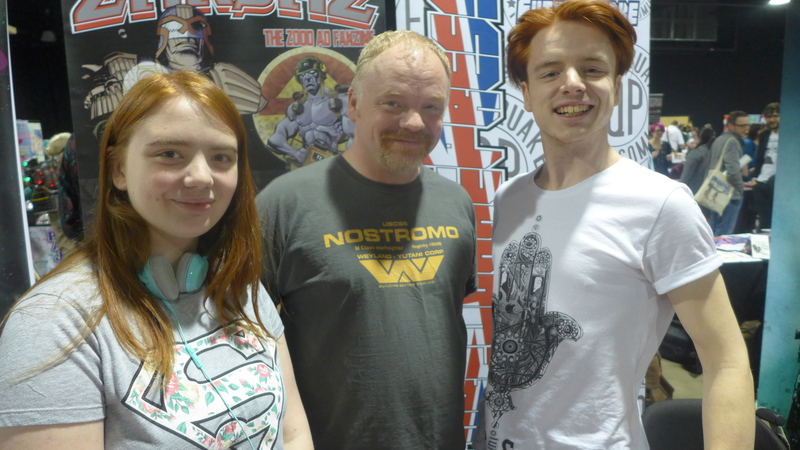 Guest writer Jim Alexander and 2000 AD Thought Bubble art competition winner 2014 Daniel Dwyer join the creators as we bring you another selection of Tales from Thargs toy box. Dogbreath is on the case once again to bring to trial the finest stories the Galactic Crime Commission can dig up. Dirty deeds- check. Time travelling murderer- check. Betrayal- check. All wrapped in a wonderful cover by the one and only D’Isreali. Can you feel it? The season has changed, the nights are drawing closer and there is a chill in the air. Time to hunker down and read the latest collection of tales from Something Wicked. In the latest 100 page issue we have Demons, Hauntings, posessions, a race for the presidency and at least one psychotic home appliance. All this is wrapped in a cover by RH Stewart. All for only £6.50– Trade paperback format. All You Zombies. Written Kirill Chernov. Art & Letters by Barry Renshaw. LeadRole. Written Alec Charles. Art & Letters by Barry Renshaw. The Thinking Dead. Written Russell Hillman. Art & Letters by Glyn White. FutureQuake 2016-Winter. Time to brace yourself as once again, FQP bring you the finest collection of stories available. This issue we explore the problems of time travel, run for the presidency, swap our brain into a robot body and in the continuing saga of Idea Space we take a pause to focus on Alan Chance. All this wrapped in a cover by ECH. 96 pages for £6.50. Trade paperback format. Bad Timed Time Travelling. Written by Mario Fernandez. Art by Rafael Chrestani. Letters by Bolt-01. King Of The Hill. Written by Dave Tomas. Art & letters by Ech. Who’s The President. Written by Carlos Pozo. Art & Letters by Edward Whatley.